The urban areas surrounding the Dallas/Fort Worth International Airport are at the crossroads of a continent, places of meeting, business, and the exchange of both knowledge and matter. To serve the people of this community, the City of Irvine recognized the importance of dedicated meeting and entertainment venues and began planning for the convention center in 1999. Following site aquisition, numerous master planning studies, and a series of social, economic, and political upheavals, the city was in a position to move forward on the building project in 2007. Located at the intersection of two major highways, with uninterrupted flatness, any building placed on the site will occupy the dashboard of on-coming traffic back and forth between Dallas and DFW International Airport. It is an opportunity to make a statement for the City of Irving and the community of Las Colinas. As the first building on the site, we recognized that the project would have the opportunity and obligation to set the tone and atmosphere for the entire development to follow. We believed it was important to create a place that was civic in scale, yet approachable and intimate for everyone. 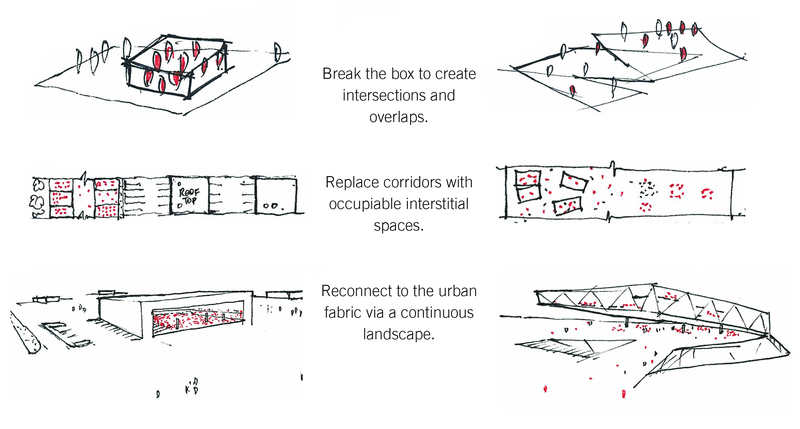 As a result, the design objectives were clarified and described as follows: Create an iconic structure in the landscape, a place that would serve as a destination and beacon at night and throughout the day. It should be large enough to command the horizon while also being intimate enough for the individual. It should be a place that allows and encourages unintended intersections while also providing discrete, secure environments for business. 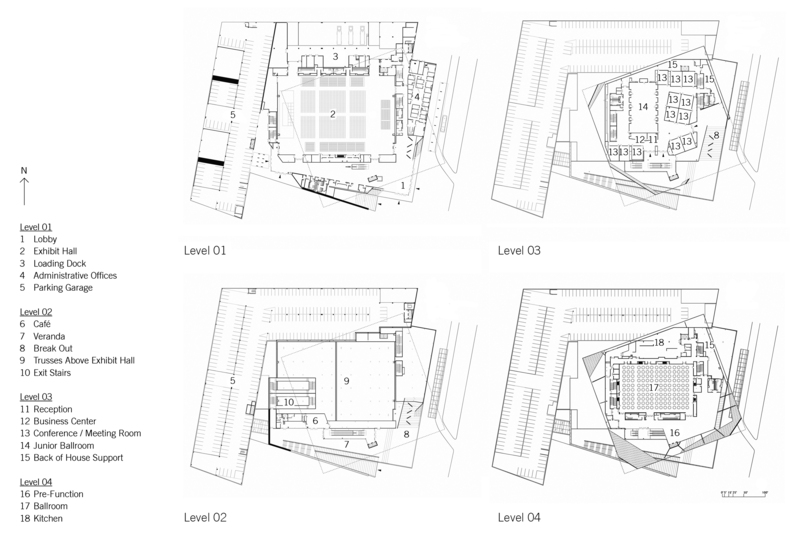 The convention center typology is one that is typically horizontal, consisting of large inward-focused building volumes. The recipe for convention centers in America has been dominated by the need to address security and efficiency. Corridors and escalators shielded behind solid walls. They are efficient, precise, and predictable. Early design studies explored the architectural heritage of the region and a number of Moorish precedents. Site visits were conducted and best practices identified through meetings with operators and staff. Massing studies explored strategies for rethinking the conventional typological models, capitalizing on the particularities of the site in Irving. 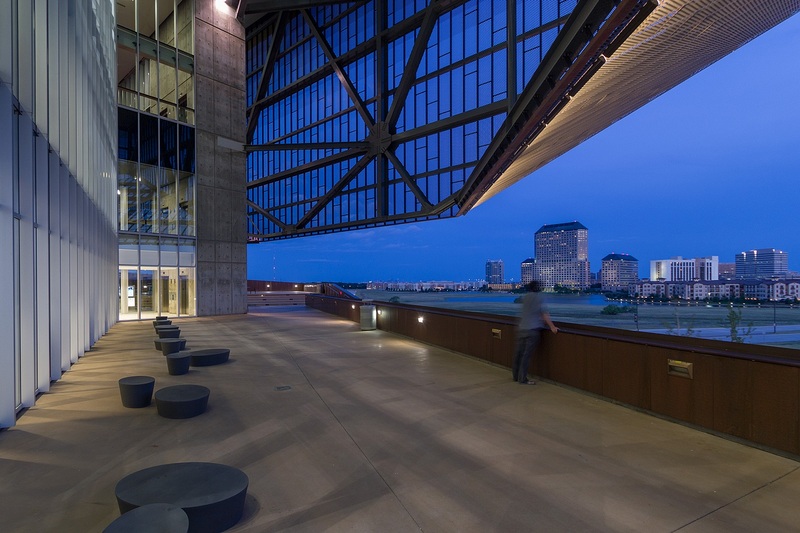 Situated at a critical node between DFW and downtown Dallas, the building needed to bridge between the vehicular and pedestrian scales. As detailed site surveys were conducted, the project’s boundaries shifted. Detailed plans for the expansion of Northwest Highway (SH 348) and the Dallas Area Rapid Transit (D.A.R.T.) rail line required 90-feet of additional right-of-way along northern end of site. New stormwater requirements required construction of a levee along the western edge of the site. Detailed plans for the expansion of State Highway 114 required 100- to 150-feet of additional right-of-way along the western edge of site. Detailed development of plans for Lake Carolyn Parkway involved shifting of intersection with Las Colinas Boulevard southward approximately 100-feet. In total, these infrastructural improvements involved reducing the development area of the site from +/- 40 acres to 26.93 acres, a reduction of more than 32-percent. At the same time, early geotechnical investigations revealed that the site included expansive clay, requiring expensive soil modifications or more complex building foundations. In response to a tightly constrained building site and to reduce the building’s footprint, the design team began a series of studies aimed at testing the viability of more vertical design solutions. 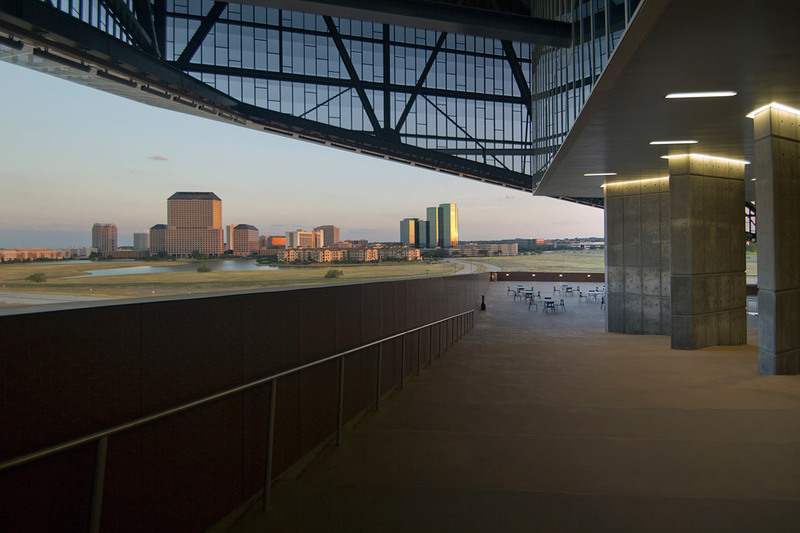 The Irving Convention Center at Las Colinas offers a critique of the typology of convention centers in America today. Designed for maximum security and efficiency, their sterile corridors and escalators leave no room for discovery, invention, and unintended intersections. The design process was thus preoccupied with the following concerns: a continuous landscape between work and play, a building that achieves an iconic scale and yet responds to the individual touch. It needed to be a place where ideas and people from different backgrounds could come together. The programmatic volumes were stacked to become a visual focus in the landscape. They were subsequently rotated to optimize views and to create large overhangs that shade the terraces. Folds were introduced to mediate the scale of the south facade for a more pedestrian presence, while the northern facade is scaled to address the long views from the highway. 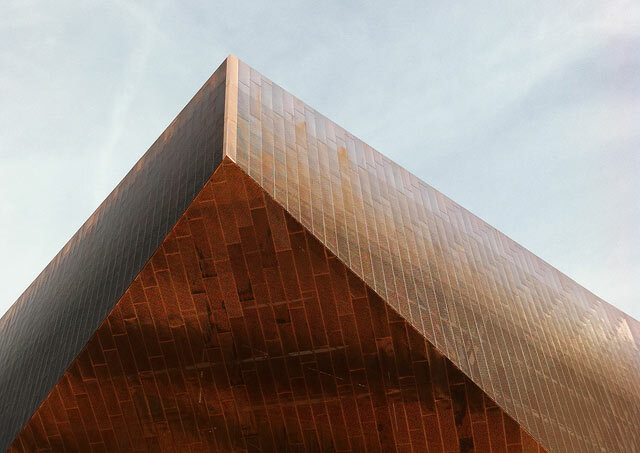 Copper was selected as a material for the building skin because it compliments the local colors, but more importantly, because it is a material that changes with every touch as its patina grows over time. The sky terrace and connecting stairs become a landscape of exchanges–a temporary suspension between the absolute public and private realms, where people leaving and arriving, irrespective of age and purpose, may meet and engage ideas. Concept studies. Image: Barbara Hillier and Winston Yeo. The first floor is organized around the 50,000 square foot column-free Exhibit Hall. This space is supported by adjacent lobbies, administrative offices, structured parking, and loading docks. Above the Exhibit Hall are 20,000 square feet of meeting rooms, including a 7,000 square foot Junior Ballroom. On the uppermost level is the 20,000 square foot Grand Ballroom and the facilities kitchen. Wrapping up and around the exteriors of these volumes are a series of ramps, stairs, and terraces, providing shaded break out spaces, meeting areas, and cafe dining. 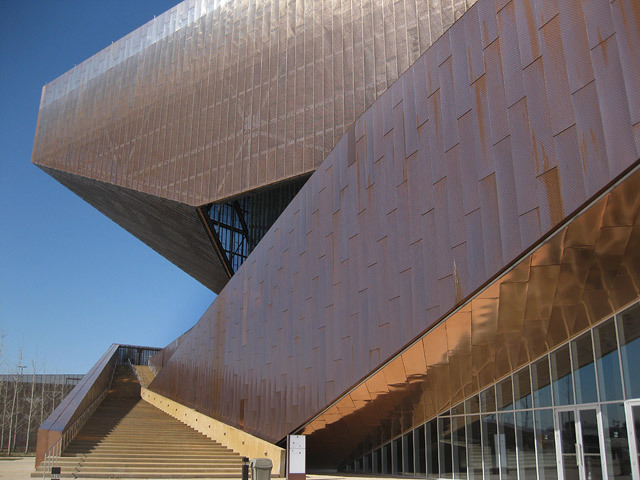 The building’s distinctive copper skin uses variably sized and shaped perforations to transition from opaque to clear. 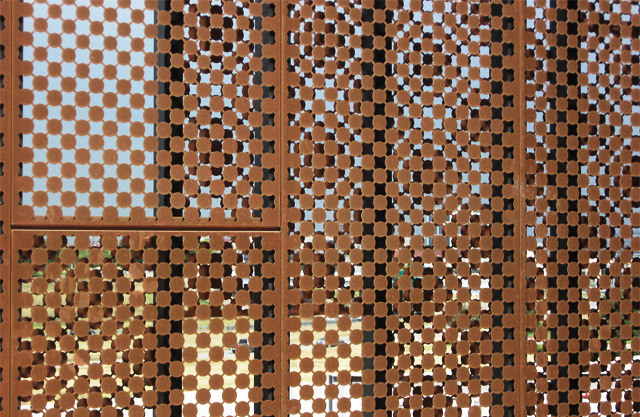 The perforations provide a sense of movement and help to mediate the scale of the facades. Inspired by M.C. Escher’s Sky and Water I (1938), the Irving Convention Center perforation pattern reduces the visual and physical weight of the building skin while maintaining consistency throughout the form. It gradates from 50% to 100% opaque in thirty feet, and is adjusted locally to accommodate various visual and performative requirements around the building. The “stacked” building form gains efficiencies with its heating, ventilation and air conditioning systems, translating into a more energy-efficient building. The vertical plan also requires less land area. Center operations use water from nearby Lake Carolyn for irrigation, and for the building’s “gray-water” systems, which account for nearly 90 percent of its water use. This saves 18.9 million gallons of water annually. 90% of the facility’s light fixtures are dimmable and programmable. 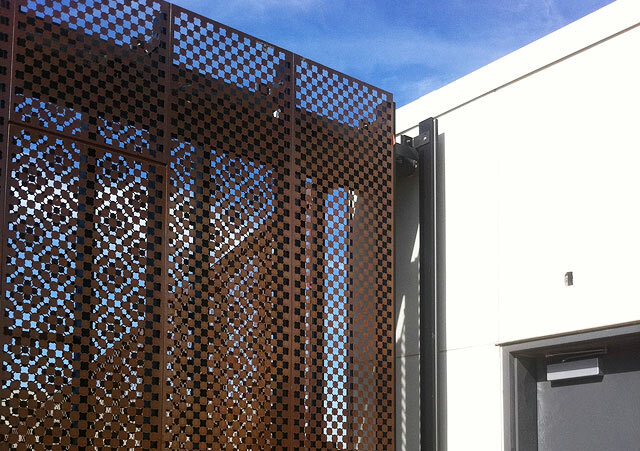 The perforated copper skin provides shade for the building while also allowing wind to naturally cool the building. The trusses of the 4000-ton steel structure were designed to be sourced domestically. Much of the steel came from recycled sources nearby in North Texas and Oklahoma. Nearly 90% of the construction waste was diverted or recycled. An integrated garage helps to reduce the amount of impervious coverage required for parking. The garage shades the loading docks and truck bays, which allows for reduced heating and cooling requirements in the facility’s large exhibit hall space on event installation days. The location of the garage on the west side of the building lessens the solar impact, while providing a sound buffer from the adjacent highway. The nearby ICCLC rail station along the Dallas Area Rapid Transit System’s DART line allows easy access to the region’s growing mass transit system. Landscaping utilizes drought-resistant plants that are native to North Texas. Project planners consulted with local horticulturists to develop an aesthetic design which requires minimal water or chemicals. Exterior spaces wrap the south side of the building, leading to the cafe and veranda level. Photograph by: Tex Jernigan, courtesy ZAHNER. Irving Convention Center at Las Colinas. Photography: Tex Jernigan, courtesy ZAHNER. The program space of this project are organized vertically, creating a series of spaces that move from floor-to-floor and allowing both visual and physical connections between people. Here the escalators from the main lobby connect the Exhibit Hall with the second level cafe and veranda spaces. Image: Barbara Hillier. 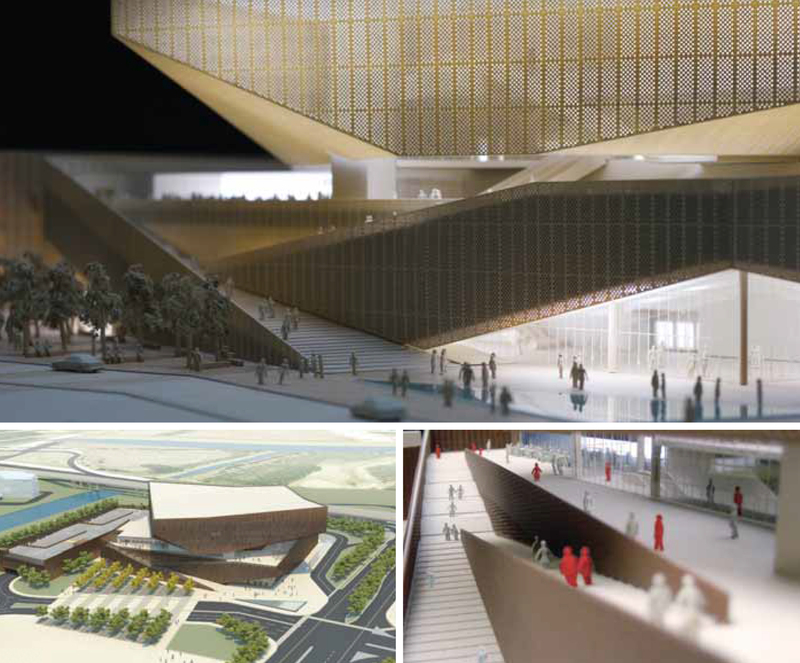 Physical models, digital models, animations, and mockups were used to develop the design of the project. Model photographs by: Jeffrey Tryon. Principal floor plans. Drawings by: Sal Tomasiello, Barbara Hillier, and Bradley Walters. Representative building sections. Drawings by: Sal Tomasiello, Barbara Hillier, and Bradley Walters. Lobby and reception area. Photo by: Barbara Hillier. Covered exterior areas provide break out spaces for adjacent meeting rooms. Photographs by: Tex Jernigan, courtesy ZAHNER. Fleck, Deborah. 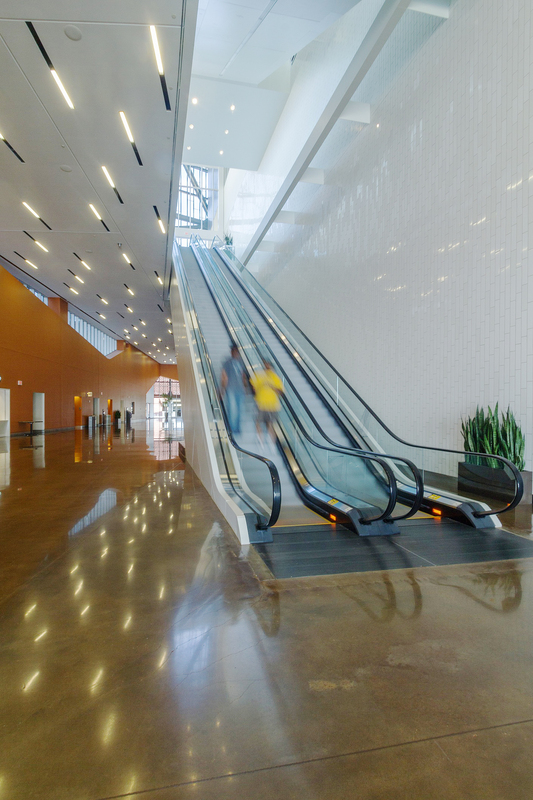 “Irving Convention Center Receives LEED Silver Certification.” The Dallas Morning News. 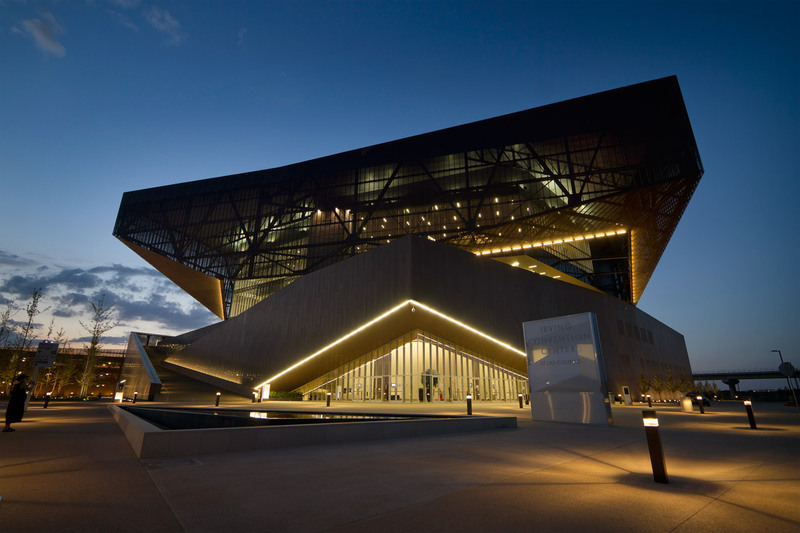 1 February 2013. http://irvingblog.dallasnews.com/2013/02/irving-convention-center-receives-leed-silver-certification.html/ (accessed: 10 February 2013). 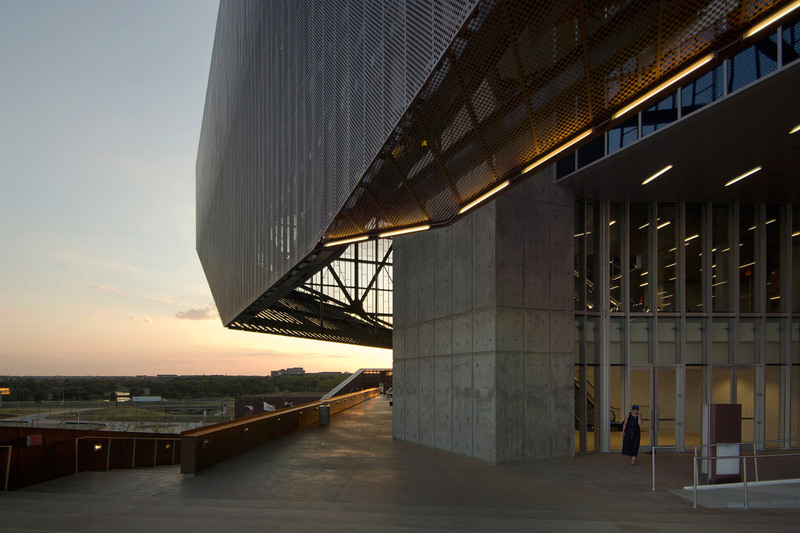 American Institute of Steel Construction, “Irving Convention Center Wins National Architecture and Engineering Award.” AISC. 15 June 2012. http://www.aisc.org/newsdetail.aspx?id=31424 (accessed: 10 February 2013). 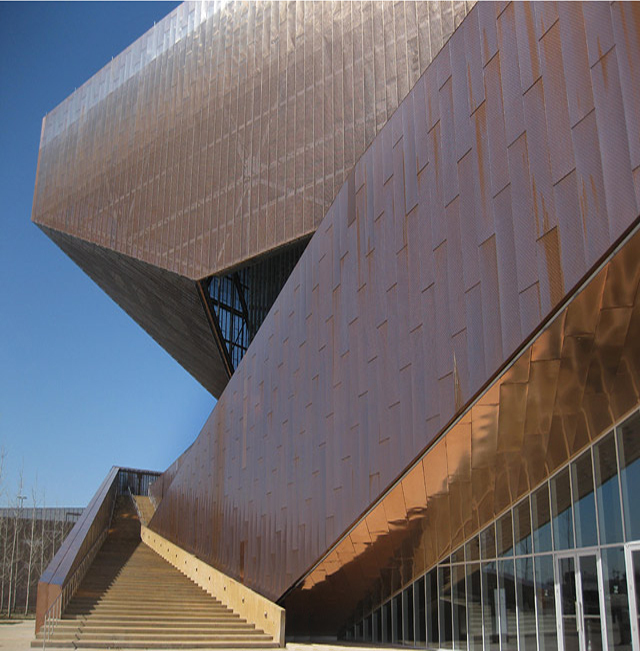 “IDEAS2 Innovative Design in Engineering and Architecture with Structural Steel Awards,” Modern Steel Construction, May 2012. http://msc.aisc.org/globalassets/modern-steel/archives/2012/05/2012v05_ideas2.pdf (accessed: 30 May 2015). 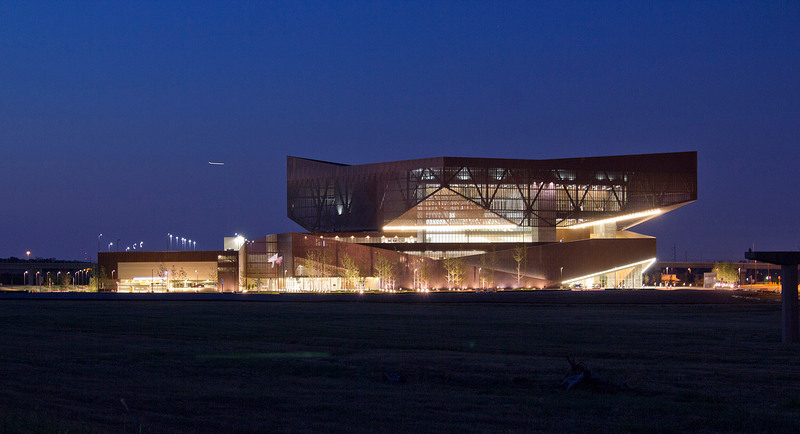 “Green Convention Center A First for City of Irving.” Engineering News Record. 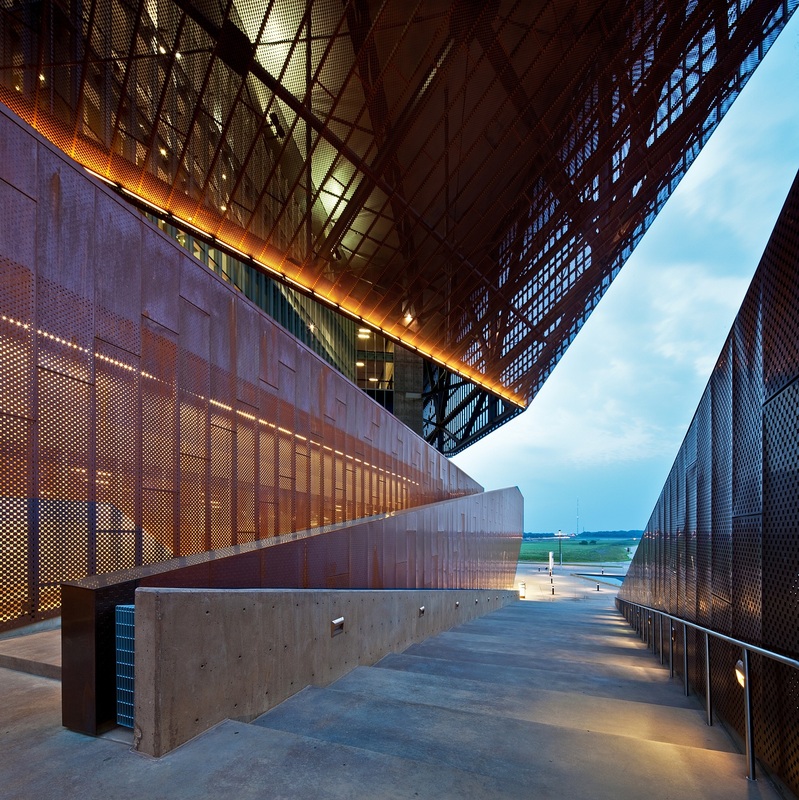 12 December 2011. http://texas.construction.com/texas_construction_projects/2011/1212-green-convention-centera-first-for-city-of-irving-.asp (accessed: 10 February 2013). “Touring Guide and Frequently Asked Questions for the Irving Convention Center.” Irving Convention and Visitors’ Bureau. October 2011. “Timeless Landmark for Las Colinas.” World Architecture News, 2 August 2011. http://www.worldarchitecturenews.com/index.php?fuseaction=wanappln.projectview&upload_id=17220 (accessed: 11 August 2011). Formby, Brandon. “Irving’s new convention center boasts dramatic exterior, Las Colinas views.” The Dallas Morning News, Published: 22 January 2011 09:49 PM, Updated: 23 January 2011 10:36 AM. 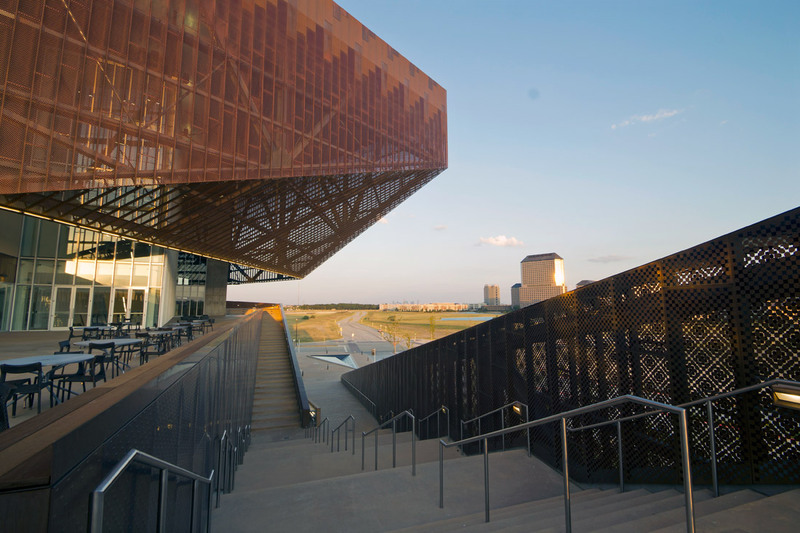 http://www.dallasnews.com/news/community-news/irving/headlines/20110122-irving%E2%80%99s-new-convention-center-boasts-dramatic-exterior-las-colinas-views.ece (accessed: 30 May 2015). 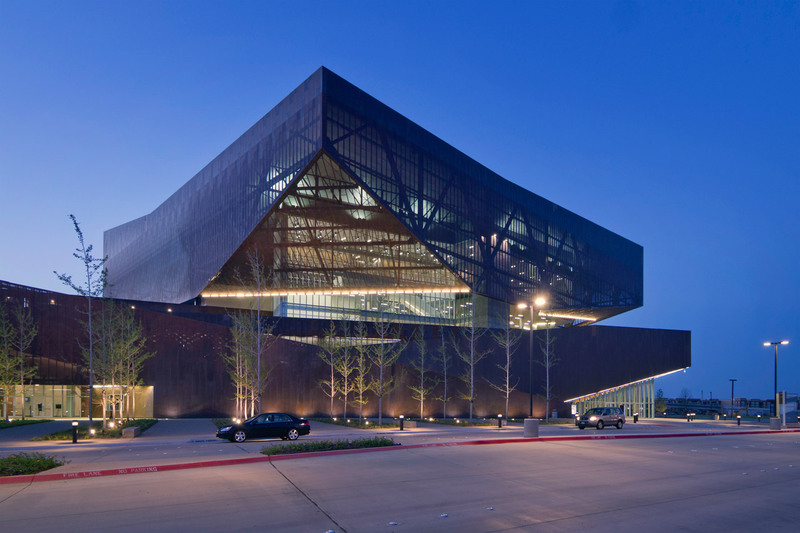 Gorsche, Jennifer K. “Irving Convention Center Facade: RMJM with Zahner.” Architects’ Newspaper Blog Fabrikator. 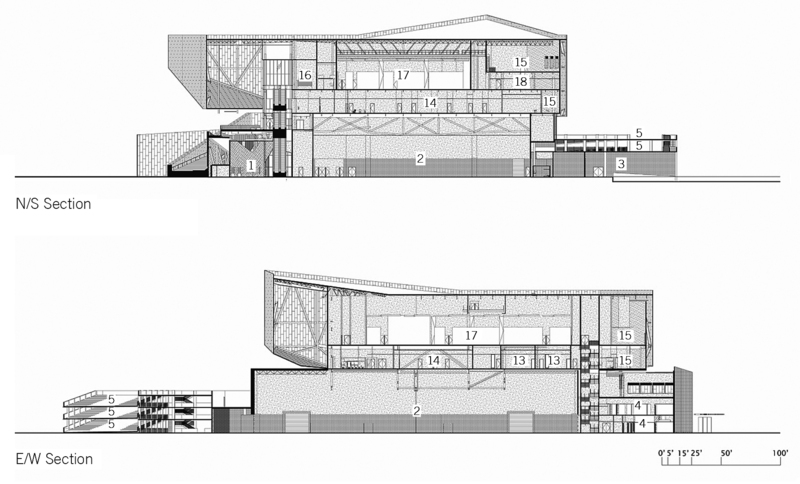 25 February 2011. http://blog.archpaper.com/wordpress/archives/13256 (accessed: 10 February 2013). “Las Colinas Convention Center,” Archello. 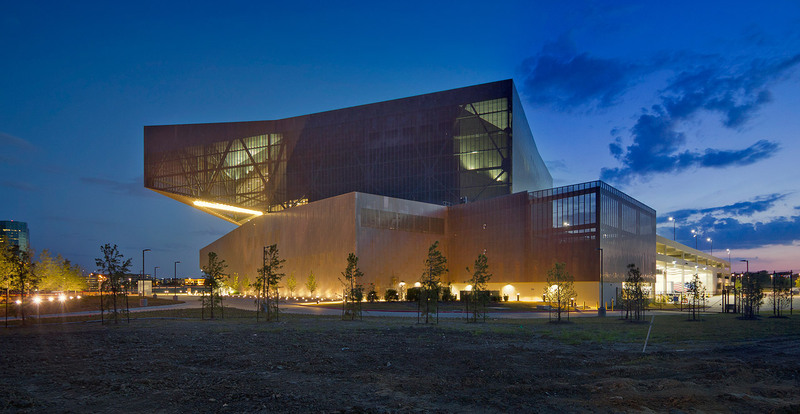 2 June 2010. http://www.archello.com/en/project/las-colinas-convention-center (accessed: 30 May 2015). Tam, Julie. “Bronze Building Soon To Be Irving’s Centerpiece.” NBC DFW. 28 August 2010. http://www.nbcdfw.com/news/local/Bronze-Building-Soon-To-Be-Irvings-Centerpiece-101724063.html (accessed: 9 March 2011). Walters, Bradley. “Analog Alchemy and Digital Digressions: Hybrid Practices.” Consillience: Connect-Include-Mediate: Proceedings of the 2009 Conference of the Design Communication Association. Marietta, Georgia: Southern Polytechnic State University. 199-206. Pfaff, Diana. 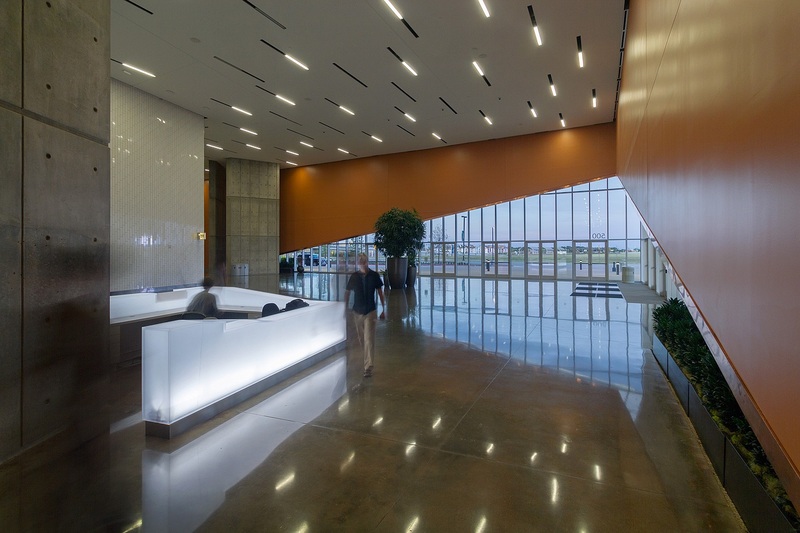 “Irving Convention Center at Las Colinas Blends Functionality with Design to Create Iconic Structure.” 4 June 2009. http://icvbmarketing.com/blog/?p=181 (accessed: 12 March 2010). Brock, Katherine Cromer. “Third Time’s the Charm.” Dallas Business Journal. 22 August 2008. “Irving Texas Convention Center Renderings Released.” Exhibit City News. 4 August 2008. Architect: RMJM (formerly Hillier Architecture), 500 Alexander Park, Princeton, NJ 08543-6395, Tel. 609.452.8888 | Fax. 609.452.8332 | www.rmjm.com. Managing Principal: Eric Jaffe; Design Principal: Barbara A. Hillier; Project Manager: Michael Jaeger; Programming, Concepts/Schematic Design, Site Design, and Design Team Coordination: Bradley Walters; Building Massing, Material Research, Design, and Documentation: Winston Yeo; Senior Technical Architect: Ernie Hunt; Project Architect: Ken Coupe; Construction Administration: Sal Tomasiello; Additional Design and Technical Team Members: Brian Wong, Andy Buchsbaum, Sara Segal, and Gregory Zilli.